Pre-dental students are a motivated and hardworking bunch, but they don’t get enough credit. Just like pre-doctoral students take the MCAT, pre-law students take the LSAT, and business students take the GMAT, pre-dental students have to take the Dental Admissions Test, or DAT, in order to get into a dental school. We talked to Dawn Sul, a pre-dental student at the University of the Pacific and president of the Pacific Pre-Dental Society, and Kyle Larsen, who attended Brigham Young University, Idaho, where he served as a Pre-Health Academic Advisor and the President of the Pre-Dental Society. Larsen then went to dental school at the University of Colorado School of Dental Medicine and now works as a dentist. Both Sul and Larsen have taken the test themselves, and offer their experience and insight. 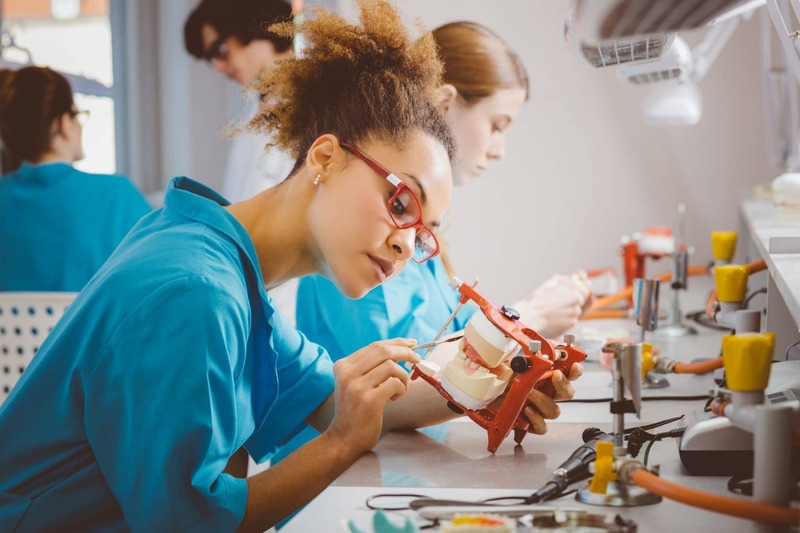 This article will explain the ins and outs of the Dental Admissions Test and those last years of undergrad before you head to dental school. Psst…check out our test prep section for loads of grad school test prep tools. The Dental Admissions Test is required as part of your application to dental school. The test is science-based, and Sul described it as similar in structure to the math and science section of the SAT–except harder. She explained that the main subject areas she studied were general chemistry, organic chemistry, biology, and perceptual ability. Scoring – The test is scored on a scale of 1 to 30. Timing – The test takes 4 hours and 15 minutes. Registering – To register, you need a DENTPIN from the American Dental Association. Get that here. Then, register through the ADA website. Sections – Sciences, perceptual ability, reading comprehension, and quantitative reasoning. Students take the DAT at varying times. Larsen suggested taking the test as soon as you can after taking organic chemistry, as this is one of the more difficult topics. He also recommended taking it over a school break, such as winter or summer break, and studying for four to eight weeks. Sul was in a three-year undergraduate program, and took the test in the winter of her second year at UOP. She studied intensely for one month over her winter break. “That was really tough but that fall semester I took courses at school that were helpful and got me ready for the DAT,” said Sul. Some students break up the sections studied for the DAT into chunks where a certain amount of time is dedicated to one section, then another, and so on. However, Sul studied a bit of each subject every day, and recommended that students follow a similar method to keep information fresh. She said that she didn’t want to forget information learned earlier in studying by moving on entirely to another subject, and found studying parts of each section everyday to be the most effective. “I strictly studied the whole day. I would wake up in the morning, then the whole morning from 9-11 would be gen chem, 1-3 would be o chem, 5-7 would be bio, and then PAT at night,” said Sul. While you may have more time to space out your studying than Sul did, it’s definitely important to keep a schedule that works for your learning style so that you can retain what you learn and study. Larsen recommended treating the studying process “like a job,” where you work from 8 a.m. to around 5 p.m. as much as possible. “Even if I did have more time I would’ve still done it my way,” said Sul. She explained that she may spread out the bulk of the work more, but would still follow a similar schedule of blocked time for each subject each day. Sul said she used study materials like videos, notes, and workbooks, and that she felt prepared when it came to test day. Another piece of advice Sul provided is to focus on the perceptual ability aspect of the test, as this isn’t covered in the pre-dental classes and the concepts take more time to get a handle on. She tells underclassmen who will begin studying for the test soon to start on perceptual ability test section. Another tip Larsen offered was to utilize practice tests throughout the process. “My advice for studying specifically is to start taking practice tests as soon as possible, because you can review it all day every day, but you never quite know how solid the information is in your mind until you’re actually taking practice exams,” said Larsen. Practice tests will not only familiarize you with the format and test your current knowledge, they can help you find out which skills and topics you need to study more in depth. You can then target these topics and use online videos, textbooks from your classes, notes, and any other resources you have available. Are there any curve balls? The short answer? Not really. This is a standard multiple choice test with defined sections. “For the dental admissions test I think it’s very what you expect,” said Larsen. He explained that every now and then someone will be thrown off by a specific article they were given in the reading comprehension section or someone may feel that the perceptual ability portion was harder than they expected, but for the most part, adequate studying is rewarded. “If you are studied up on what topics are covered, you’ve taken practice tests, you’ve done your due diligence with that, nothing is really off about anything,” said Larsen. However, a few things people forget about are the timing and the more “underrated” sections. Larsen suggested timing yourself when taking practice tests so you aren’t thrown off by this factor, and to not disregard the math or reading sections when studying. While most people finish at least a year of undergrad before taking the DAT and it’s preferable to take organic chemistry first, there are other ways to get a head start even in your freshman year. What else should you be doing to prep for dental school? Of course, there are things to do to prepare for dental school in the last year or two of undergrad aside from taking the DAT. Sul explained what she is doing to build experience and round out her background. Over the summer, she shadowed at a dentist’s office to get hands-on experience. Additionally, she’s taking non-science courses. “This year I’ve ventured out. Over the last two years, all I’ve taken are science-related courses, but this year I wanted to take a business class because I realized that a major part of dentistry is also a business so that’s what I’m doing,” said Sul. She also has attended interview workshops to prepare for the upcoming dental school interviews. Additionally, you can participate in an internship, an on-campus pre-dental club like Sul’s, and look for schools you’d like to apply to. There are plenty of ways to get involved and plugged into the dental network, helping you feel ready to enter the next chapter of your education. While the DAT can be intense and you want to give it your all, keep in mind that this isn’t the only thing dental schools look at when making admissions decisions, just like the SAT isn’t the only thing colleges view. Staying on top of your work and the test is a very important part of undergrad for a pre-dental student, but remember to also enjoy your last year and to reach out within the dental community to get you excited about your future as a dentist. Want help retaining the information you study? Check out the Dean Vaughn Total Retention Program.